In what was a tough GP for all teams and riders, organisers were forced to reduce the length of the event due to heavy rain and deteriorating track conditions. Following the cancellation of Saturday’s qualifying races, the second MX2 moto ended prematurely and the second MXGP moto was cancelled. Initially announcing the cancellation of the second MX2 moto, race organisers decided to reinstate the results from Sunday's last moto so both race one and race two would count for the overall classification. Detailed moto two results are yet to be published. For Kjer-Olsen's Rockstar Energy Husqvarna Factory Racing MX2 teammate Thomas Covington the GP of Indonesia brought mixed fortunes. Fighting his way up to 11th after a bad start in moto one, the American had a fall and was unable to finish race one. Battling his way from the back of the pack in moto two, the American earned eighth for 13th overall at the Indonesian GP. Battling through sickness, Conrad Mewse endured a tough GP in Indonesia. Fighting his way back after a bad start in moto one, the young Brit managed to finish as high as 15th in MX2 moto one. Getting one more bad start in moto two, he settled for 24th. Wraping up the GP in 22nd place overall, Conrad will be looking to improve his results during the upcoming races. In the MXGP category the Indonesian event proved to be a challenging one for all Rockstar Energy Husqvarna Factory Racing team riders. Gautier Paulin raced a consistent opening MXGP moto to finish 13th for 13th overall at the GP. With two rounds completed the Frenchman is currently seventh and two points behind a provisional top six in the MXGP championship standings. 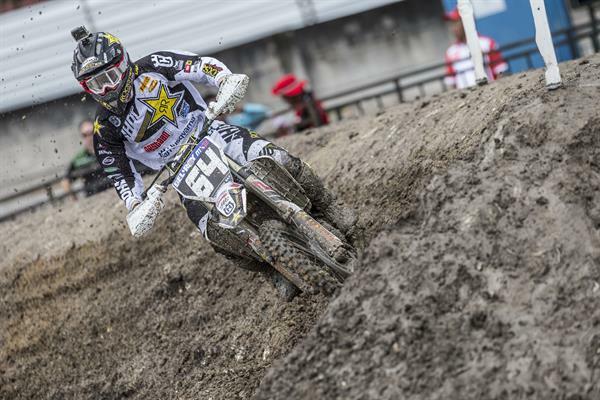 Following a similar approach to Paulin, Max Anstie put in a steady ride to bring his FC 450 home in 14th place. Collecting 14th overall at the GP the MXGP class rookie sits 12th in the points standings. Rockstar Energy Husqvarna Factory Racing’s Max Nagl got a good start in the MXGP moto and found himself racing as high as 10th. With the track deteriorating as the race progressed, the German’s bike got stuck in a very deep rut and he was unable to finish the race. The Rockstar Energy Husqvarna Factory Racing team will return to action at round three of the 2017 FIM Motocross World Championship in Argentina on March 18/19. Thomas Covington: “It’s been a challenging GP. With not much time on the track before the opening moto I was feeling a bit insecure as to how to approach the race. When the gate dropped in moto onw I got close to a few other riders so quickly found myself outside the top 20. I tried my best to get closer to the top but as I was battling for the top 10 I crashed and couldn’t get the bike to start again. Then in the second moto my start was better and I managed to finish eighth. It's good that we collected a few points at this GP but there's still a long way for us to go. I'll continue working hard to get closer to the top in MX2."